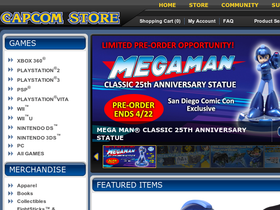 At Capcom Store, online at Shop.Capcom.com, you can find an assortment of video games and related merchandise. Capcom Store sells games for Playstation 2 and 3 as well as for XBox 360, Wii, and Nintendo. You can also buy branded gear including: hats, t-shirts, hoodies, and even custom Nike shoes at Capcom Store. In addition, messenger bags, soft and hardcover art books, and limited edition collectibles and figurines are available at Capcom Store. At Capcom Store, fightsticks and controllers as well as game movies and movie soundtracks are also on sale. RetailSteal.com has the best Capcom Store coupon codes, Capcom Store discounts, Capcom coupons, and Capcom promo codes. Shipping and handling rates at Capcom Store depend on the pricing of your purchase and your shipping destination. See website for full details. Exclusions may apply. Shop online at Capcom.com and enjoy up to 80% off video games for PS3, XBox, PC, and more. At Capcom Store, buy the Okami Hoodie and get free shipping on your entire order. Click link to buy now. Act now and take advantage of up to 40% savings on Capcom apparel from Capcom.com. Save up to 75% or more on games for Nintendo Wii at Capcom Store. Click here to shop. Check out Capcom.com and save up to 40% off a wide range of collectibles including Street Fighter, Dark Void, Mega Man, and more. Get Street Fighter IV for PS3 from The Capcom Store online and save 75%. Save up to 75% off Resident Evil for PS3, PC, Xbox 360 from Capcom.com. Click link to shop. Get the Capcom logo blue hoodie at Capcom Store for $39.95. Click link to shop online. Use this discount at the Capcom Store and save $5 on Preorders of Dead Rising 3 Aficionado today. Purchase the Monster Hunter 3 Ultimate from Capcom store and get a free controller pro with your order. Click to save.